Garage doors come in various forms and one of the most popular options is the wooden garage door. And when you want dependable garage door installation services, you can count on the experts at Pros On Call. In addition to wooden garage door installation, you can also count on us for all of your garage door maintenance and repair needs. Give us a call today to request a free quote and to learn more about what we can do for you. Our licensed team of garage door service experts has been in this business for years. And we’ve seen tons of different reasons why customers need new doors. 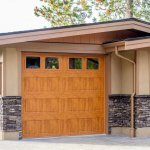 How Much Does It Cost For Wooden Garage Door Installation? The total price will vary from project to project. The cost of your new wood door installations will depend on a few different factors including the size, width, and how many new doors you will need (do you have a single, double, or more garage door home?). Other factors that can affect the price include things like adding high-tech garage door openers or locks. No matter how much it will cost for your new wooden garage doors, we are committed to providing all of our customers with upfront prices before we begin any installation job. Another variable to consider that will affect the price is the different material options and style preferences. Garage doors made from White Oak are more durable than other options and can range in color from white to light brown. You also have the option for wood stain as well. These garage doors are best known for standing up against impacts and shock. This may be a good option if you have a new driver in the house. For a more rustic look, alder garage doors are the way to go and color options range from reddish brown to golden brown or honey. Color options tend to range from light beige to a dark red. Although not the strongest wood, Mahogany garage doors is available in different textures and often a more visually appealing choice. With a similar look to mahogany, Spanish Cedar garage doors are the right choice for anyone concerned about decay, rot, or insects. And, when you choose Pros On Call, you will have the added benefit of being able to choose from the top brand names in wooden garage doors. A few examples include Sears, Hormann, Windsor Republic, Dynaco, Carriage House, and more. 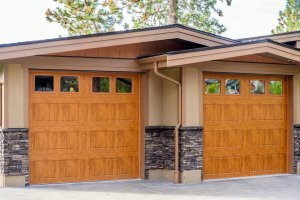 Confused about which type of wooden garage door to choose? No need to worry, our experts can help you choose the perfect option that will match your budget and your style preferences. While the cables of a garage door can last a lifetime, poor wooden garage door maintenance and amateurish repair services can cause extensive wear and tear. When the torsion cables break, the garage door comes off its track and becomes difficult to operate. In most cases, the door can be stuck between the wedges. Since the door will move in a diagonal manner, the rollers will come out and cause it to sag. A sagging door will exert excessive pressure on some springs while increasing the tension on others. Our professional garage door repair services are vital since the poor distribution of weight on the springs could have some catastrophic consequences. Call us to schedule an appointment or request our emergency garage door services. We should also mention, we provide a complete range of security solutions. That means that in addition to the best wooden garage door installation services around, you can also call us for a complete range of expert locksmith services. Basically, your safety and security needs are our top priority! Wooden Garage Door https://prosoncall.com/garage-doors/installation/wooden/ 3.6/5 based upon 21 reviews.